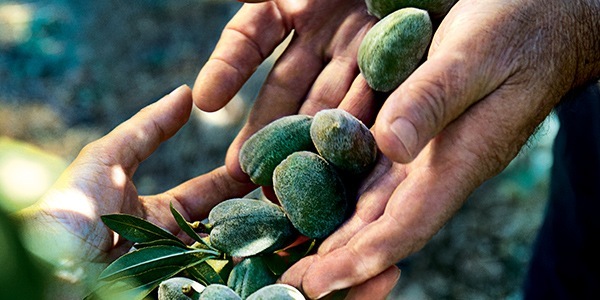 Why should you use almond body care? Longing for a beautifully radiant glow? Craving deliciously scented skin? Dive right into Almond body care products and delight your senses with our silky-smooth textures and mouthwatering aromas. As a bonus, you’ll also enjoy beautiful skin. 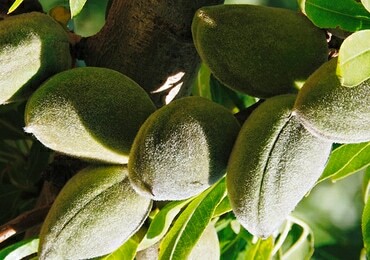 Almond is well known for its ability to help nourish the skin. 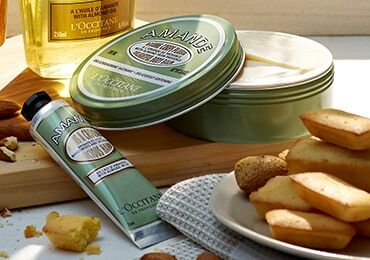 L’OCCITANE has harnessed the exceptional beautifying power of the almond from the south of France and built it into body care products that are both deliciously tempting and wonderfully effective. An oil in the shower may seem counterproductive, but a high-quality shower oil effectively cleanses skin of dirt and grease, meanwhile leaving skin feeling nourished and comfortable. 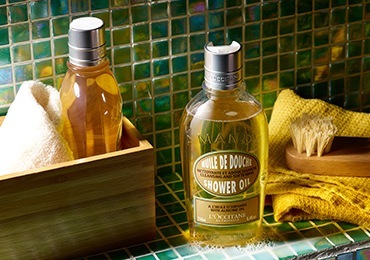 You can wash up with Almond Shower Oil as you would with your usual shower gel or soap. When in contact with water, this deliciously appealing oil turns into a dreamy milk texture. Just rinse with water for soft and supple skin that isn’t left with a greasy touch. Think you’re squeaky clean now? Cleansing doesn’t end here! Using a proper exfoliant, like Almond Delicious Paste, 1-2 times a week will upgrade your body care by buffing away old skin, leaving behind skin that’s ready to absorb moisturizing properties and glow. Need a quick in-and-out option? Opt for our 2-in-1 cleansing and exfoliating products, like the squeeze-tube Almond Shower Scrub or the Almond Delicious Soap in a convenient shape that fits right in the palm of your hand, and get both jobs done at once. 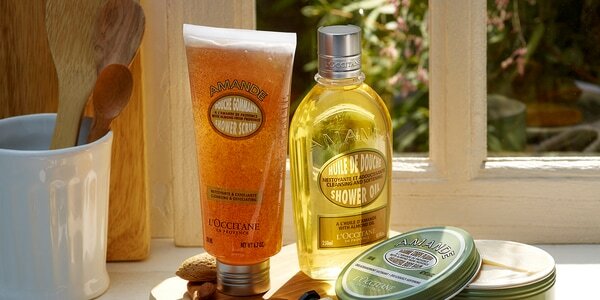 Dispense Almond Shower Oil into palm, loofah or usual shower preference. Wash up by massaging into skin using a slow circular motion. Smooth Almond Delicious Paste onto damp skin with gentle circular movements, focusing on rough areas, like the heels, elbows and knees. Work from the bottom to the top for best results. Finish by rinsing again with warm water. 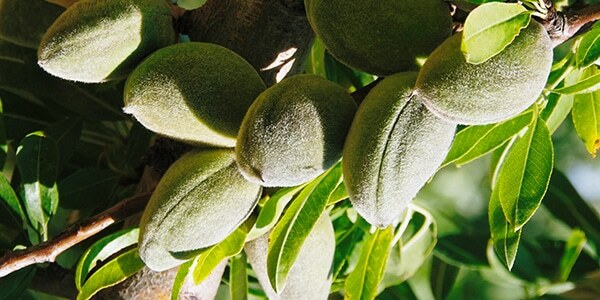 For Almond Shower Scrub, squeeze into palm of hands and gently massage into damp skin. For Almond Delicious Soap, create a lather by dampening soap and skin and gently massaging onto body. Finish by rinsing with warm water. Give your moisturizing routine a boost with a delicate, yet effective body oil. A quality body oil helps transform the way your skin looks and feels. Need a reason to try out our Almond Supple Skin body oil? Well, we can offer more than just one. 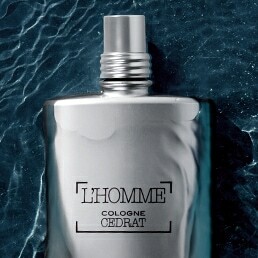 Dispense into palm and warm up product by rubbing hands together. Massage into skin with upward circular motions, focusing on zones concerned by skin slackening (thighs, buttocks, tummy and arms). Let body oil absorb into skin for a quick moment before proceeding with body care ritual. For those in a hurry, massage onto damp skin as soon as you get out of the shower and then pat dry with a towel. It quickly absorbs and leaves you skin feeling incredible! For some, a body oil may be enough to meet hydration needs – but others may need a proper moisturizer to enjoy soft and comfortable skin. 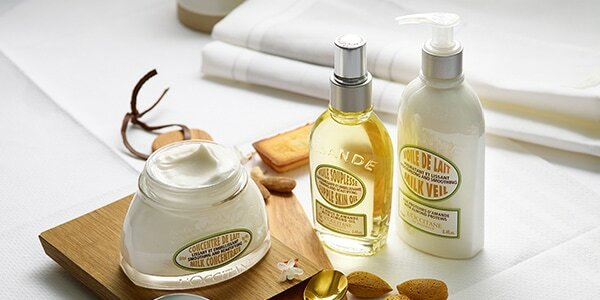 Wrap up an intensive body care ritual with a cream or a lotion, depending on your skin’s needs and your own preferences! 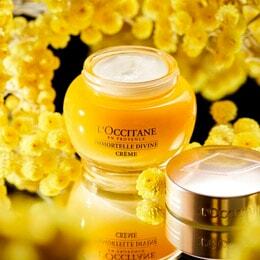 A cream, like Almond Milk Concentrate, is ideal for normal to dry skin types that seek nourished and softened skin. This silky texture melts into the skin, helping your skin look smoother. A lotion, like Almond Milk Veil, is great for normal skin types that are looking for hydration from lighter textures. The Milk Veil is fast absorbing, to quickly help skin feel soft and moisturized. Micro-pearls leave a luminous glow, perfect for summer dresses. A balm, like Almond Delightful Body Balm, is perfect for normal to dry skin types that want an intensely moisturizing and softening beauty product. Its rich and melting texture leaves behind an ultra-soft finish and is perfect for regular pampering routines. Take a generous amount of Almond Milk Concentrate or Almond Milk Veil in the palm of your hand and massage into the skin, with upward circular motions. Focus on areas like the thighs, buttocks, tummy and arms. Warm a small amount of Almond Delightful Body Balm in the palms of your hands and massage the rich texture into the skin with slow and circular movements. Target rougher areas of the body, like elbows or knees. Include this balm in your weekly or regular pampering routine.